I've always loved meteorites, and I started collecting after I learned there was a large market for them. I'm relatively new to meteorites, though I've been trying to photograph fireballs for some time and calculate their paths. Quite recently a few of us have gone together and established a Norwegian meteor network. We aim at establishing a nation wide camera network and act as a hub for collecting and sharing information. Over the past half a year or so I've established (with some help in particular from Morten Bilet who's the top collector here) a new website for this purpose. We still lack a proper camera network, but a few of us have some cameras that record things. We've recently had a couple of spectacular meteorite finds here in Norway. In 2006 about 50 km south of Oslo one guy was nearly hit by a meteor that landed 1 meter from him. Several more fragments were found, including one that hit a roof. In 2012 it happened again. A meteorite went through a roof in central Oslo. Several other fragments were soon found, the biggest one weighing more than 3 kg. We're just getting organised, and I'm sure it will lead to some discoveries eventually. Here's a couple of pictures (Morten's collection). I'm not sure if I've noticed that before. Can you link a video and timeframe for what you're looking at? At first I thought it was just nonsense and faked. Then I looked at other versions of the same video and noticed there is something there, so I changed my mind and I've wanted to have a closer look at it but I never got around to do it. Since you asked about it, I had that closer look at it now, and I think I can explain it. It's not faked, but it's not real either. I believe they are coding artifacts. On the first video, they appear to shoot out, but also notice that the video has been stabilised. On the second video, you see the same things shooting out, but notice that the things shooting out are static in the video frame while the fireball moves due to the shaking of the camera. Look at the first video again, and see that the specks on the windshield move together with stuff shooting out. So it's a combination of coding artifacts and stabilising. EDIT: Look at the videos in full resolution at Youtube. Difficult to see the details if they're embedded here. Good for you for helping set up a meteor monitoring network! There are not very many of those worldwide, and where they do exist they tend to do quite well and can have great scientific value. I think you will find that it does not take a whole lot of data collecting before a significant event is found. 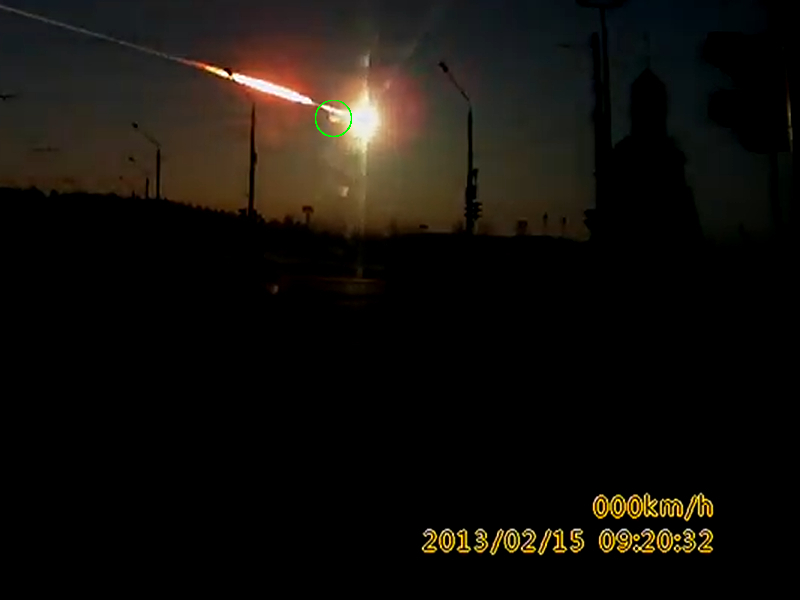 I think I agree with your conclusion on the apparent lights shooting out from the Chelyabinsk meteor. My first guess was that it was lens flares from the windshield and/or camera lens. (Similar things may be seen in other videos, sometimes even appearing as lights that get sucked into the meteor, rather than shooting out from it.) It might even be this and video artifacts acting together. It is extremely brief and seems to produce more of a non-luminous vapor cloud than a fireball. It does not appear to produce persistent smoke, either, so I don't know if it is significant or not. I have not been able to see it in other vids, either. Since there are so many videos, there could be some clues that hints the location of bigger chunks (if there were any). Hopefully some will do it (and share the results). I caught two fireball events on video last year which also caused a loud boom, meaning that meteorite fall is quite plausible. While there exist many eye witness accounts at least in one if the events (the other was late at night and mainly woke up people because of the shaking and sound), the trouble is that they're not accurate. Having pictures or video is absolutely essential to narrow down a realistic search area. Much of Norway is mountains, and it's not easy to find a few small rocks if the search area is 100 km² of rubble. It's not worth trying. And it takes at least two cameras to get useful results. So I don't think there was any serious attempts to find meteorites after these two events. The search area simply gets to big. There was a third event last year that I got which was caught on another camera. So we know that the fireball made it to 31 km, which makes it a candidate for meteorites, though less likely. Last year was special (this year is very quiet), but no doubt a few more cameras will lead to meteorite discoveries. And even if we don't get good enough data to make it worth a search, it's useful to record these events, so if someone stumbles across a meteorite later, we can go back and perhaps find out when it happened and also find more if we know the general direction. The LRO spacecraft observed the impact sites of the GRAIL spacecraft and took before and after images, showing the craters and ejecta from the spacecraft impacts. A welcome result after the disappointment of the Deep Impact crater! It's literally just scratched glass. My eyes do this at night, when looking at a street light (not to such an extent, though). That would be fingerprints/smears on the glass. Look closely; the windshield is covered with them. Deep Impact might have made a disappointing crater, but it did make the most impressive bang! Shame we couldn't get images like that of the Ebb/Flow impact, as well as the crater. At least LRO got some science out of the plume though. Yep, you're right, just optical effects from the glass. It's visible even beforehand but I didn't notice. There are several effects here, including these, but the question was those specks appearing to move considerably faster than the fireball, and they look precisely like coding artifacts and I'm pretty sure that that is what they are. You can get specks like this if the encoder decides that the residual is too small to bother to transmit or it decides to remove extra possibly high cost transform coefficients after quantisation. In this case it looks like the encoder a bit too eagerly decided not to encode some blocks (signalling no residual, no motion vectors). I've seen these things many, many times, having worked for over 13 years with video compression. It's among the things you have to pay to get a low bitrate. Anyway, the clue is that the fireball moves due to shaking while the specks are static relative to the frame as if the camera was tracking these specks. Which it of course doesn't just happen to do. That proves that the specks are not real. We don't really have to explain exactly how the specks were formed. Just saw this article about the potential comet impact with Mars. (Source is NASA). Impact probability is claimed to be 1 in 2000, but the significant thing to me is the author is claiming a likely nucleus diameter of only 1 to 3 kilometers. That would basically kill any chance of the high-end apocalyptic scenarios we had been discussing earlier. Nevertheless, it would still be a tremendous event if it were to occur; greater than any impact humanity has ever observed on a terrestrial world. The article doesn't give any evidence or reasons why the comet likely is around 2 km in size. But typical comets are between that size and up to around 50 km, and most frequently in the lower end, so that might by why they say that. This comet was discovered pretty far out, so it must have a significant coma already. I wonder if that tells us anything about its size. Or perhaps just that it's volatile. If we are to wonder what cannot yet be rules out, such as the comet hitting Mars, I suppose we in that spirit still can assume a 50 km comet until we know more.